DSL-4 La Mare-Le Carillon Nose: The American attack kicked off a 08.00 hours, from the start, the advanced proved to be time-consuming with heavy casualties. 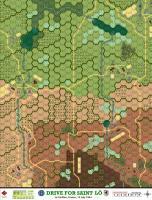 The Germans, were using the terrain skillfully and to the best of the their advantage by setting up defensive line after defensive line to effectively slow and in some places stop the Americans' advance. But as the afternoon waned, the Americans had managed to fight their way to top of the "Nose". One more pushed would surely be enough to capture the high feature. 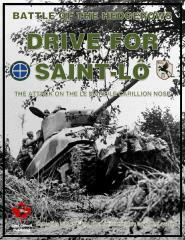 DSL-5 The Drive for Saint-Lô: The BIG scenarios of the module, for those who don't want to play the Tactical Mission (Campaign Game), this scenario covers the entire map.